Irregular verbs are some of the most difficult parts of speech in any language, and if you come across them in a foreign language prepare to be shocked! The cure? 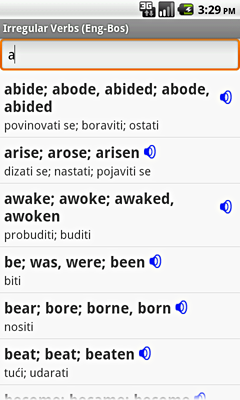 This English <-> Bosnian Talking Irregular Verbs application! It shows the spelling and pronunciation of the three most important forms of irregular verbs: infinitive, past indefinite and past participial.